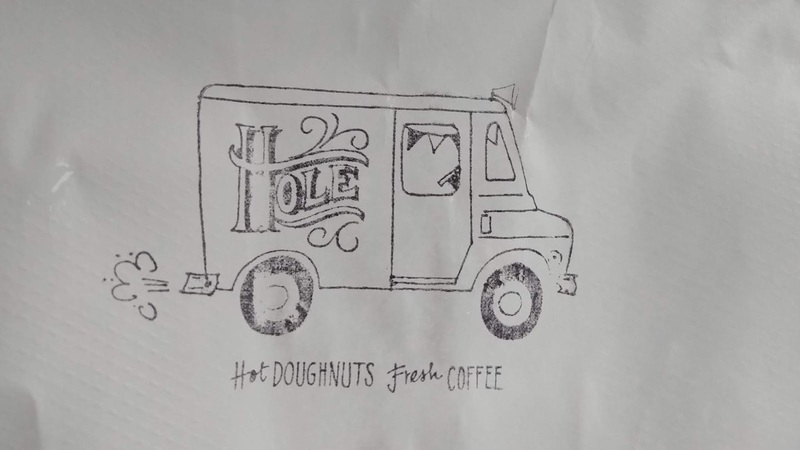 When we were in Asheville, we wanted to try Hole Doughnuts. We like doughnuts. A lot. 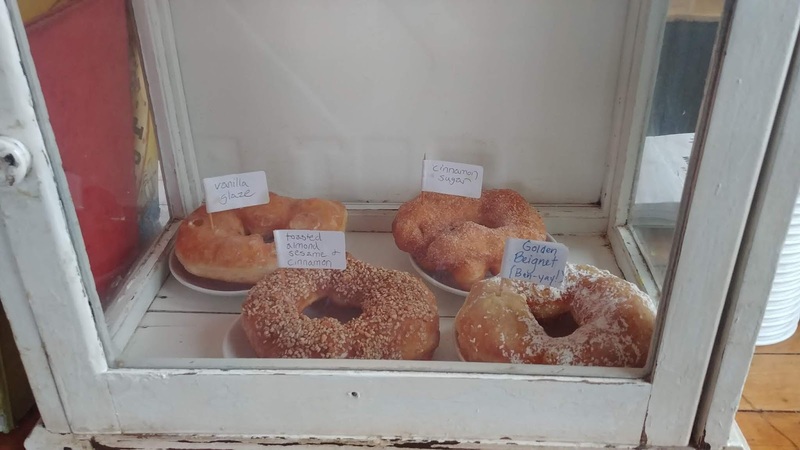 Damaris & Rutledge went to Hole Doughnuts on an episode of Southern & Hungry and we were intrigued by the flavors. 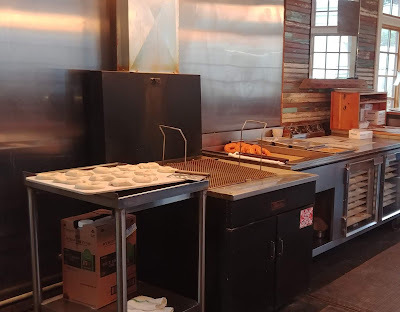 There's so much food to try in Asheville and we missed out on several places due to lack of time but we did manage to get to Hole Doughnuts as we were heading out of town. Doughnuts for the drive home! I was already wedged into my seat for the drive home with snacks, beverages, entertainment, and blanket arranged around me, plus it was raining, so SP ran in while I waited in the car. The parking lot is smallish and can be tough to get in/out. The doughnuts are fried to order so SP was excited to watch the doughnuts being made. He took some photos on his cell phone. 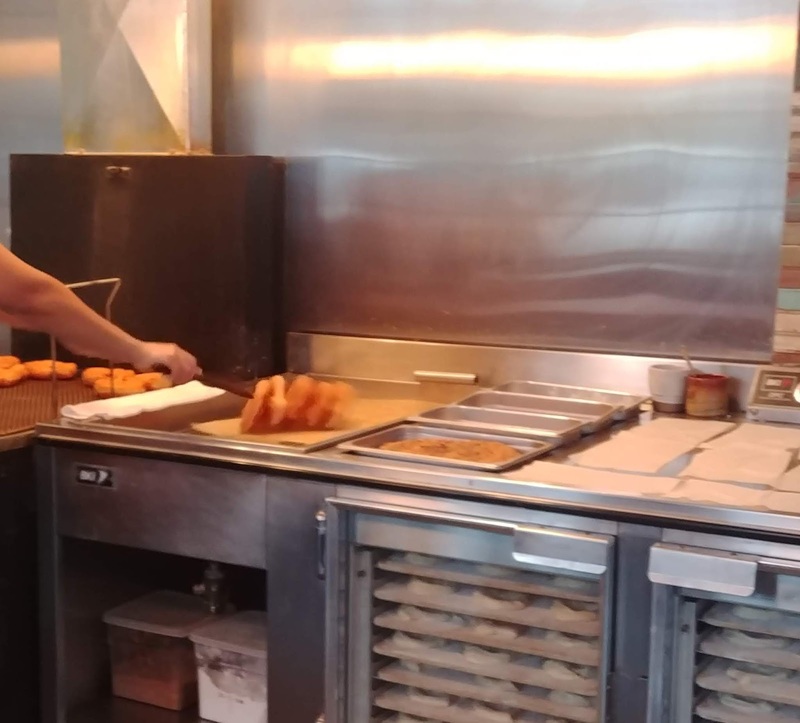 Freshly fried doughnuts coming off the... doughnut stick? The flavors when we were there. They offer 4 doughnut flavors. We got one of each to try. Back row: Vanilla Glaze and Cinnamon Sugar. Front Row: Toasted Almond Sesame & Cinnamon and Golden Beignet. 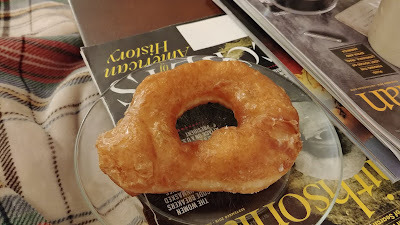 We ended up being too full from my birthday dinner the night before to try any doughnuts on the drive home but we did eat them after we got home for dessert that night. According to their website,"All of our doughnuts are made from a single yeasted dough recipe. The recipe contains organic stone ground flour from Lindley Mills, unrefined organic cane sugar, sea salt, cage free eggs and whole butter, and are fried in non-GMO rice bran oil." Basically, that means these doughnuts are super yummy. Like we wish we'd been able to eat them when they were hot yummy. 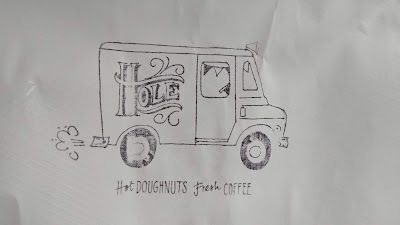 If we're back in Asheville, we'll definitely get some Hole Doughnuts again - but next time eat them hot.